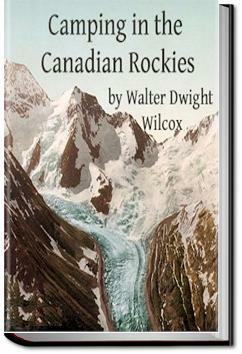 An Account of Camp Life in the Wilder Parts of the Canadian Rocky Mountains, Together with a Description of the Region About Banff, Lake Louise and Glacier, and a Sketch of the Early Explorations.
. . . some of the trees were close to the building. Usually in the early morning, before the sun has warmed the atmosphere and started the breezes of daytime into motion, the lake is tranquil and its surface resembles a great mirror. About nine o’clock, the first puffs of wind begin to make little cat’s-paws at the far 27 end of the lake, which widen and extend until finally the whole water becomes rippled. A gentle breeze continues to sweep down the lake from the snow mountains toward the Bow valley all day long, and the water rarely becomes smooth till after sunset. This is the usual order of events in fair weather, a condition which may continue for several weeks without a drop of rain.